Get more out of your trip to Portugal by visiting some of its most interesting areas on this private day trip from Lisbon. Customize your itinerary, so your interests, needs, and wants are all met. During this tour, travel to the Sanctuary of Fátima, Batalha, and Óbidos. Start your day bright and early with morning pickup at your Lisbon hotel. Your first stop is at the Sanctuary of Fátima, a group of Roman Catholic buildings and structures. If you’d like, you can have a chance to help out in a ceremony. Your guide also fills you in on the history and importance behind this area as you admire its gothic architecture. 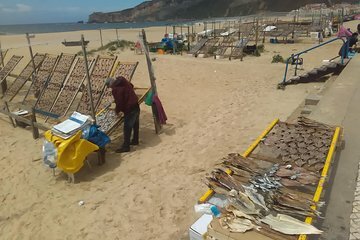 Other stops on this tour include a monastery in Batalha, the fishing village of Nazaré, and the medieval village of Óbidos. While in Nazaré, keep an eye out for the waves in the water. They’ve been known to reach up to 98 feet (30 meters), which are some of the biggest in the entire world. Your tour ends with drop-off at your hotel in Lisbon. Note: This is a private tour, so please list any special interests you have (art, architecture, history, culture) at the time of booking to alert your guide, so that he or she can better prepare for your private experience.